What does it mean to be wealthy to you? For many Americans, it can mean being able to leading a life that is stress free, while having “peace of mind”. Sounds pretty good, right? On the surface, that doesn’t sound too much like money is the focus. However, it could also be said that that same money, or perhaps, a lack of it, can lead to a certain stress factor. According to Bloomberg, many Americans do not feel the need to admit that assets are able to purchase happiness. 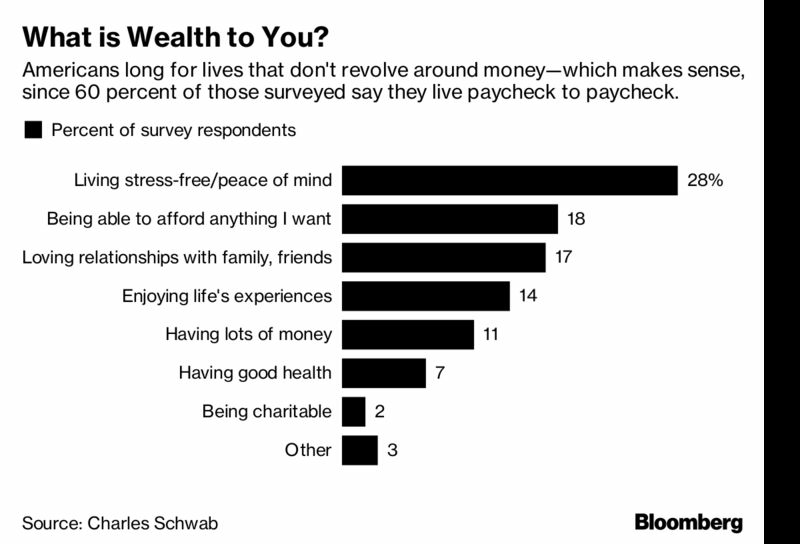 A mere 11 percent of those who were surveyed for Charles Schwab’s second annual Modern Wealth Index selected “having lots of money” as what it means to be wealthy. Interestingly, most respondents selected such high-minded concepts as their means for being content, they had no difficulty in attaching a number as to just how to get to that point in their lives. That being said, to be financially wealthy and comfortable in America today requires an average of $1.4 million, which is up from $1.2 million a year ago, per the survey. You might ask what’s the net worth needed to be “wealthy”? That would be an average $2.4 million, which is the same as last year in the online survey of 1,000 Americans between age 21 and 75. All You Need Is “Wealthy” Love? The survey also asked respondents to select which of the below statements came closest to their personal definition of being wealthy. 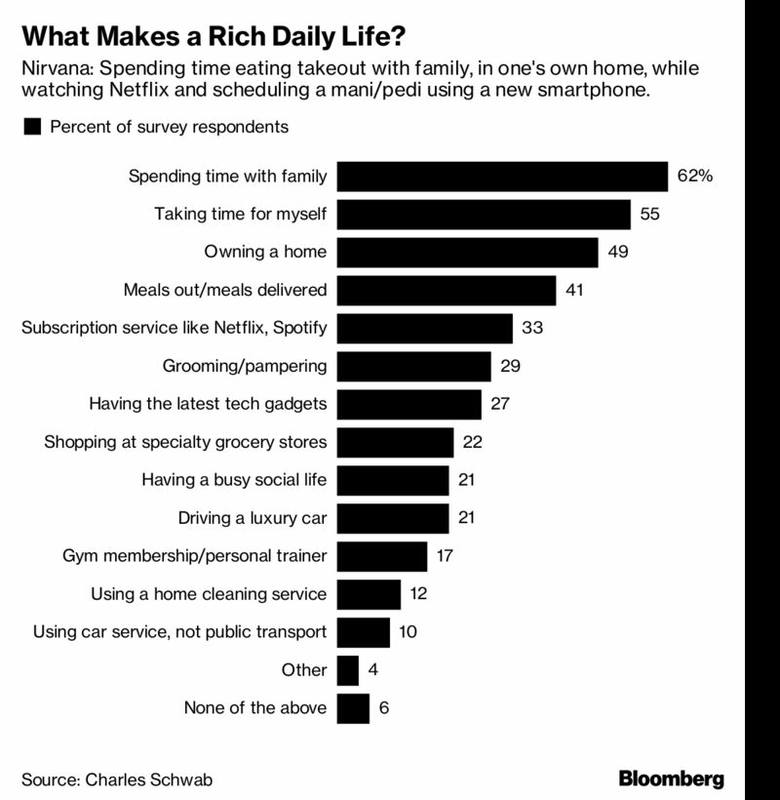 When asked about what made respondents feel “wealthy” in their daily lives, the survey found that family time was most commonly cited, at 62 percent overall. Following that was what we all seem to pursue in some shape or form, cited at about the same level across generations: “taking time for myself,” which came in at 55 percent. Alas, it can be rough to accomplish either “wealthy” feat without having some money to go along with it. You Can’t Be Wealthy Without a Little Luxury, Right? Is It “Luck”? Or “Hard Work”? 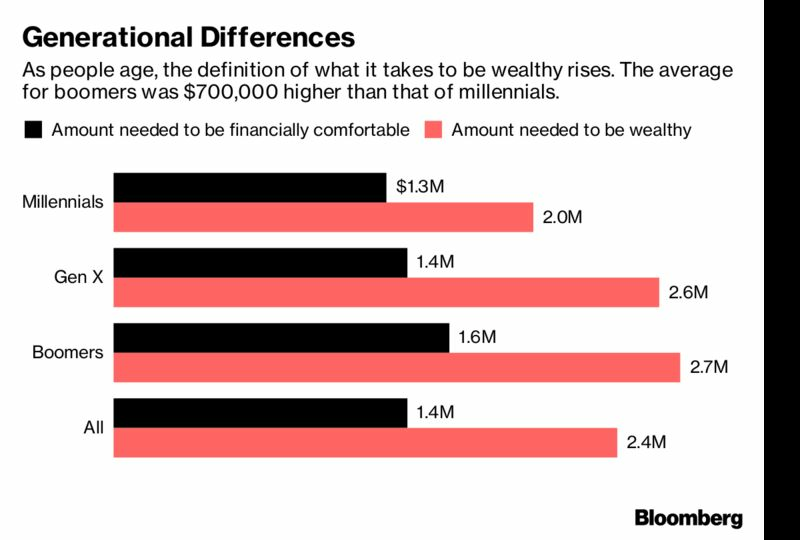 For all the bashing that millennials may sometimes receive, it can’t be discounted that their young optimism was clearly visible when thinking about their finances. A large 64 percent of twenty- and thirty-somethings feel that they will be wealthy, when it comes to money, at some point in their lives, versus 22 percent of baby boomers. The remaining 11 percent? Luck. With a background in accounting and finance, Matt Tilmann is the founder of Script-Notes.com, where he spends time to save readers both time and money, by offering the latest deals, savings and other news of the day in the world of tech, current events and personal finance. Make sure you never miss the latest by liking Script-Notes on Facebook.